A gorgeous, authorized celebration of one of the most popular and enduring super-heroes of all time - Wonder Woman - that chronicles the life and times of this pop-culture phenomenon and image of women's strength and power, from her origins and role as a founding member of the Justice League to her evolution in television and film. 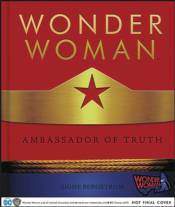 Wonder Woman: Ambassador of Truth tells the complete story of this iconic character's creative journey. Signe Bergstrom examines Wonder Woman's diverse media representations from her wartime comic book origins to today's feature films, and explores the impact she has had on women's rights and empowerment and the fight for peace, justice, and equality across the globe.